Few days back, Google’s Election hub got a major facelift with launch of new features like Pledge to Vote, Google Score of Politicians and Hangouts. Today Google announced yet another feature that would be quite helpful to millions of online Indians. 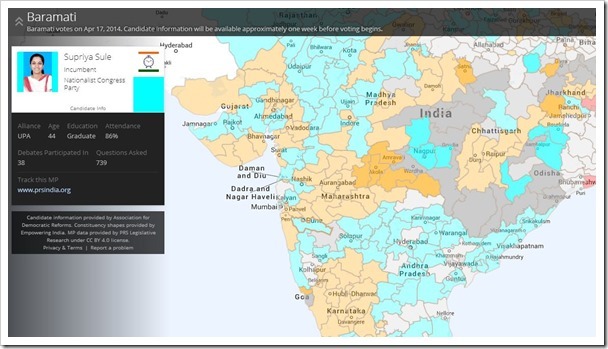 The new feature called “Know Your Candidates Tool” will help users to visually find any Lok Sabha constituency on the map and then check out all candidates that are in the fray. This new tool will allow you to get easy access to relevant information about political candidates contesting from your constituency and the incumbent Member of Parliament. It provides information like Age and education of the candidate, what is the attendance of incumbent candidate along with debates they have participated in and number of questions asked in the Parliament. The tool will also provide other valuable information like their financial declaration and social media presence if any. The tool also integrates YouTube candidate bios being produced by Ping Network. The tool offers visual representation on the map, so one can easily identify which seats have gone to which party. Google has aggregated information of various political candidates from publicly available information sourced from Indian organizations such as Association for Democratic Reforms (ADR), PRS Legislative Research and Liberty Institute India. It’s interesting how much information is available in regards to election this time around on the internet. Never in the history of India was so much information available about elections, so easily. I am sure with the kind of buzz and coverage these elections are getting, the voting percentages are expected to be much higher than ever before! What do you think? Why Samsung Can’t Take A Break (Even Though It Is On Top)!